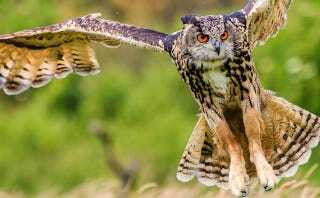 There's a terrorist eagle owl wreaking havoc in the small Dutch town of Purmerend, 1o miles north of Amsterdam. The wild owl - who has taken up residence in the town - has been swooping down and digging into human flesh. The owl has attacked 20 residents so far, some of whom had to get stitches.
" 'During the day there's no problem, but at night we now only venture outside armed with umbrellas, helmets and hats, anything really, to protect ourselves,' " said De Bruijn.
" 'The problem is that you don't hear the owl before it strikes. Its claws are razor-sharp,' she said.
" 'We hope the city will soon catch this rogue bird.' "
The swift and powerful European eagle owl, also known as the Eurasian eagle owl, is one of the largest owl species, with a 6-foot wingspan. It's a protected animal in the Netherlands, so the town — which warns on its official website that "the safety of our citizens is at risk" — needs special permission to catch it. According to a report in the Dutch English-language news site NL Times, "The municipality plans to apply for an exemption from the province so that the bird can be caught and released somewhere else." Thank god these menacing creatures live in Europe and there is a big and wide ocean that separates us from Europe.